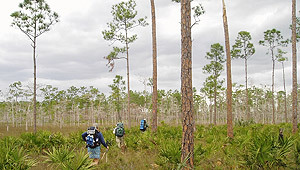 The largest wilderness east of the Mississippi, the Everglades are home to multitudes of unique plant and animal species, including the last remaining Florida panthers, the endangered American crocodile, and the invasive Burmese pythons. Curious visitors can explore ecosystems that range from dim mangrove forests to stretches of the sawgrass marshland nicknamed “the river of grass.” Though this fragile wetland is internationally recognized for its biodiversity and role in reducing the effects of climate change, less than one-third of it is protected. Over the years, The Trust for Public Land has added 48,000 acres to Everglades National Park, permanently safeguarding critical habitat area from development.